As deep neural networks grow in size, from thousands to millions to billions of weights, the performance of those networks becomes limited by our ability to accurately train them. A common naive question arises: if we have a system with billions of degrees of freedom, don't we also need billions of samples to train it? Of course, the success of deep learning indicates that reliable models can be learned with reasonable amounts of data. Similar questions arise in protein folding, spin glasses and biological neural networks. With effectively infinite potential folding/spin/wiring configurations, how does the system find the precise arrangement that leads to useful and robust results? Simple sampling of the possible configurations until an optimal one is reached is not a viable option even if one waited for the age of the universe. On the contrary, there appears to be a mechanism in the above phenomena that forces them to achieve configurations that live on a low-dimensional manifold, avoiding the curse of dimensionality. In the current work we use the concept of mutual information between successive layers of a deep neural network to elucidate this mechanism and suggest possible ways of exploiting it to accelerate training. We show that adding structure to the neural network that enforces higher mutual information between layers speeds training and leads to more accurate results. High mutual information between layers implies that the effective number of free parameters is exponentially smaller than the raw number of tunable weights. 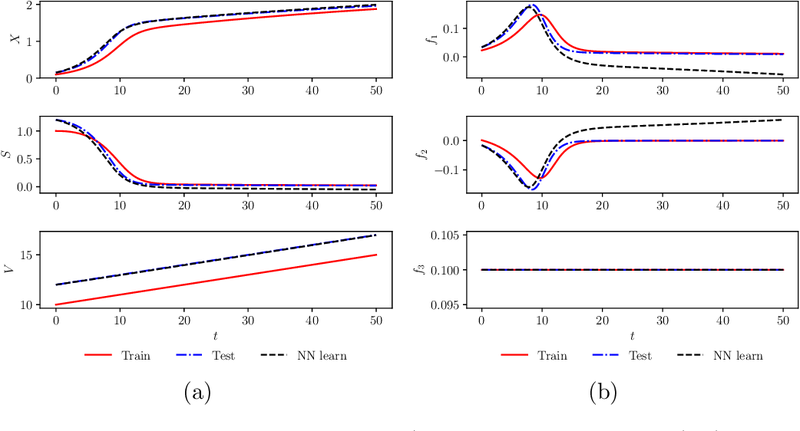 We investigate the use of discrete and continuous versions of physics-informed neural network methods for learning unknown dynamics or constitutive relations of a dynamical system. For the case of unknown dynamics, we represent all the dynamics with a deep neural network (DNN). When the dynamics of the system are known up to the specification of constitutive relations (that can depend on the state of the system), we represent these constitutive relations with a DNN. The discrete versions combine classical multistep discretization methods for dynamical systems with neural network based machine learning methods. On the other hand, the continuous versions utilize deep neural networks to minimize the residual function for the continuous governing equations. We use the case of a fedbatch bioreactor system to study the effectiveness of these approaches and discuss conditions for their applicability. Our results indicate that the accuracy of the trained neural network models is much higher for the cases where we only have to learn a constitutive relation instead of the whole dynamics. This finding corroborates the well-known fact from scientific computing that building as much structural information is available into an algorithm can enhance its efficiency and/or accuracy.